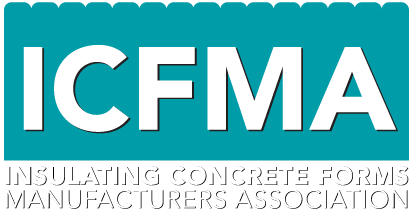 Ottawa, ON., March 21, 2017 – The Insulating Concrete Forms Manufacturers Association (ICFMA) recently commissioned a comprehensive series of impartial studies comparing traditional insulated wood frame cavity wall construction to standard 6 inch (150mm) core insulated concrete form (ICF) walls. The study was surprisingly revealing; confirming dramatically superior ICF energy-efficiency performance. For decades, the ICF Industry has been asked to provide definitive proof that thermal mass, the air-tightness and continuous insulation features of ICF walls deliver real, quantifiable benefits. Many studies have been conducted in the past by the Portland Cement Association (PCA), the Canada Mortgage and Housing Corporation (CMHC) and the Department of Housing and Urban Development (HUD) all of which were either based on limited field comparisons or thermographic computer modelling. This is the first time a fully SCC and IAC Accredited Testing facility has been commissioned to evaluate a realistic side-by-side comparison of the two types of wall assemblies within a single study. The study quantifies the benefits of BOTH thermal mass and the continuous insulation properties of ICF technology over traditional code compliant wood framed cavity insulated systems. The reported results comparing the two wall assemblies prove the ICF assembly took nearly 324 hours to reach steady state performance under an exterior air temperature of -31 degrees F (-35 degrees C) whereas the wood frame wall reached steady state within 60 hours of the start of the test. Steady state is the point at which the amount of heat being delivered to condition the interior space was exactly equal to the rate of heat transmission that was going through the wall. Although the lag time has been corroborated in previous studies, CLEB’s studies have clearly illustrated when comparing the amount of energy required to maintain both walls at steady state over this same 324 hour period, the wood frame wall consumes 149% more energy than the ICF wall. Even AFTER both walls attained steady state under the test conditions, the ICF wall consumed 58% less energy than the wood framed wall specimen to maintain temperature. What does this mean for consumers? Consider two typical 2,000 square foot wall area homes – one constructed in wood frame to permitted code minimums, the other constructed to the same wall area using ICF technology and subjecting both to the same test condition. In terms of average kWH value for all of North America, this study proves that during the most extreme cold conditions an ICF wall could end up saving between $100 and $180 per month in equivalent electrical consumption over any traditionally constructed wood frame wall. With this press release you will find a copy of the Thermal Performance Report completed by CLEB Laboratories for the ICFMA with more information and details. A PDF of this report can also be found online at icf-ma.org/thermalstudy. Next post Press Release: Breakthrough thermal study proves ICF walls provide up to 58% more R-Value/RSI than wood frame Walls.